Sophia, Olivia, my mom, dad, and I went to Grand Marais for a few days. It was much-needed respite time for my mom who (in addition to her own medical issues) is taking care of my dad who has Alzheimer’s Disease. For my dad, it was an opportunity to see a part of the state he visited frequently 30-40 years ago. He use to take camping and fishing trips to Lake Saganaga on the Gunflint Trail. For Sophia, Olivia, and me, it was a chance to spend time in an area that we enjoy visiting, see some new places along the Gunflint Trail, and create memories with my parents/their grandparents. After the first stop at Tobies in Hinckley (a place where my mom and dad use to take my sister, brother, and I when we went up north when we were younger), we stopped in Duluth. 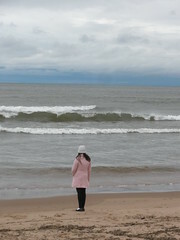 This is Sophia on the beach looking out at Lake Superior. It is a refreshingly chilly day. A little further north, in Two Harbors, Olivia and Sophia spotted four deer crossing the road. Traffic stopped in both directions. 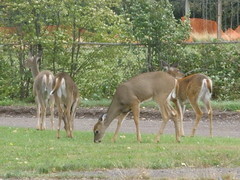 We drove slowly to where they were eating and watched them for awhile.